Which Will Drive Us Into the Future? 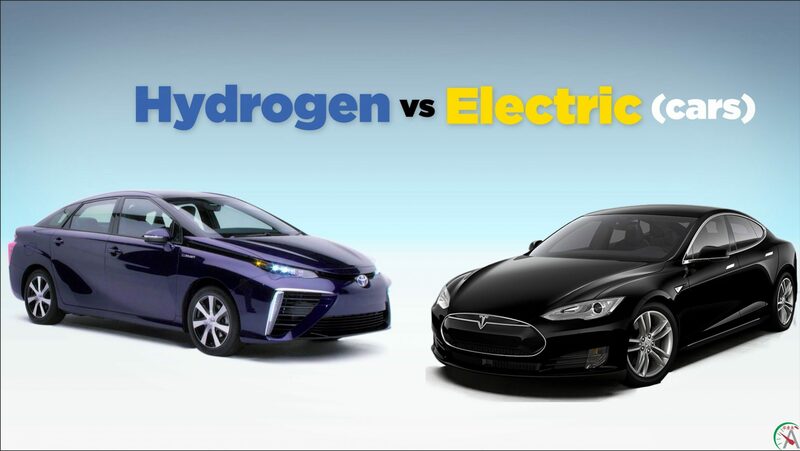 The debate between electric vs. hydrogen fuel cell cars rages on. Last year, Toyota made a big announcement that they were getting closer to unveiling a hydrogen fuel cell car, calling it the “ultimate environmentally friendly car.” That car, the Mirai is already available in Japan and Europe. And today, in conjunction with Back to the Future Day, the Mirai became available in the U.S.
“It drives like a regular car, operates like a regular car. You can refuel in three to five minutes and, you know, do 350 miles on a trip,” Craig Scott, Toyota’s national manager for advanced technologies in the U.S., told Ira Flatow in a Science Friday interview last month. However, there are even fewer hydrogen refueling stations than there are electric charging stations. Tesla has been rapidly building its network of supercharging stations around the country, with 534 stations and 3,024 superchargers to date. In total, there are 10,000 electric vehicle charging stations in the U.S., Levi Tillemann, a fellow at the New American Foundation and author of The Great Race: The Global Quest for the Car of the Future, said in the interview. In comparison, “there are 12 public hydrogen refueling stations in the entire country, with about 10 of those in California,” he says.